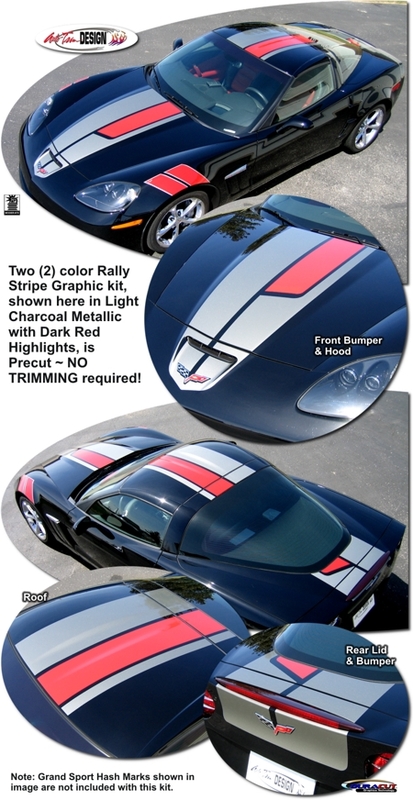 Make your Chevrolet Corvette C6 stand out from the rest with this Hood, Roof and Rear Deck Lid Two (2) Color Rally Stripe Graphics kit. This stripe package is not just a set of straight strips in a box. Our graphic kit consists of prefitted and contoured pieces as shown in the illustration. This kit is specifically made for the '05-Current Chevrolet Corvette C6 Coupe, Convertible, Grand Sport or Z06 and will not fit any other vehicle. Stripes are designed for a center spacing of 1" (25.40mm) at time of installation. Trimmable Spoiler Kit #ATD-CHVCRVTGRPH69 consists of two (2) pieces 16" (40.64cm) in length that can be trimmed during installation for custom spoiler applications. Convertible Waterfall Trim Kit (ATD-CHVCRVTGRPH91), if selected, uniquely finishes off the Roof Cover area within the passenger area of convertible models. 'Click' Here to view the Parts List for this item.